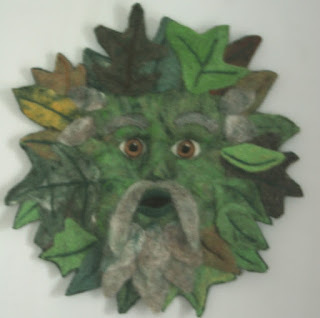 I finished the Green Man yesterday morning before the market. 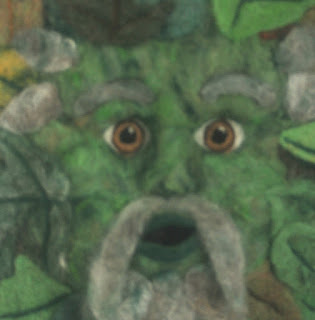 I just had to; he was so close, and I love having a Green Man hanging in my tent. It's like a focal point - it draws peoples' eyes and brings them in. And he did! The boy wanted him to have a beard, so there it is. Of course this one is now his favorite! 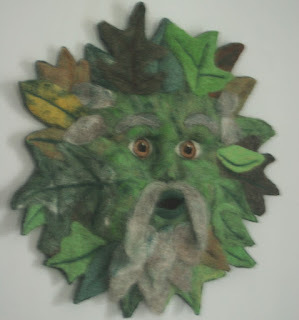 He also helped by blending colors for the leaves and he even felted a couple of them. I guess the boy should get a cut when he sells! The first thing I did was to start to combine colors for the leaves, and then felted the leaves, each one separately. When they were done, I chose a felted sweater for the backing, and began building the face onto it. He has a core of white roving for the face, which was covered with a mix of greens. When the face was in place, each leaf got felted on; then the face and the leaves were needled a LOT to get the shape and firmness I wanted. Details like the beard, eyebrows and veins in the leaves were then added, and I needled around each leaf to make them stand out. He was then cut out from his backing, and a hanger was sewed onto the back. Whew! He's done!